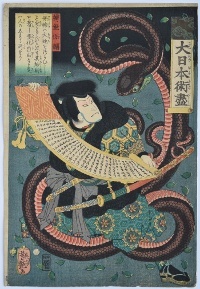 A fine design showing the outlaw Yasusuke Hakamadare surrounded by a giant snake amidst falling leaves. He was able to disguise himself using the skins of animals and this translated into the notion that he could transform himself into these creatures or conjure them up as in the case of the battle between Raiko and Hakamadare where he invocates a giant snake. (The subject of another triptych design by Yoshitsuya.) From a rare set: Dai Nihon jutsu zukushi, “An Assortment of Magic in Great Japan.” This talented pupil of Kuniyoshi had a penchant for snakes, and produced some striking prints. Published 1861. Fine impression. Very good colour and condition. Full size with extra paper around. Signed Ichieisai Yoshitsuya ga.